This week, the Tuesdays with Dorie group baked Thumbprints for Us Big Guys. The recipe was selected by Mike from Ugly Food for an Ugly Dude – very appropriate, because my cookies were kind of ugly! Check Mike’s blog for the recipe or look on page 164 of Baking: From My Home to Yours. What I did: I cut the recipe in half and used ground almonds (the recipe calls for hazelnuts, but almonds are one of the alternatives provided). I filled them with Nutella instead of jam. How it went: The dough was very crumbly, but I thought it would be like Dorie’s sweet tart dough – crumbly at first but then easy to press together after a rest in the refrigerator. However, after chilling (the recipe does not tell you to chill the dough, but I did), the dough was still very crumbly and I had to work to form it into balls and then press a dent in the middle. Some of them spread quite a bit during baking. How it tasted: They were fine, but kind of blah and very dry. The Nutella was a nice addition. My husband said that they were good but not the best cookies I’ve made. I thought about trying some with filled with jam, but he vetoed that idea. I noticed that the recipe doesn’t have any salt in it and I wonder if adding some would have helped. Would I make this again? : No. These didn’t quite do it for me. I thought these would taste like a nutty shortbread. Oh well, on to next week! Actually I don’t think I’m making next week’s recipe, but I’ll be back the week after for another shot at some cookies. Too bad you didn’t like these, I haven’t made them as I was baking loads and loads of cupcakes for my moms birthday. Sorry these weren’t your cookie of choice Jill – they look wonderful though (funny how a dusting of confectioners’ sugar does that)! I used Nutella too – but think the jam might have gone over better… for some reason. Oh well – there’s more cookie in a couple of weeks! I love the idea of Nutella in these cookies. I’m sorry that they didn’t ring your bell, but they really look delicious. I was so tempted to add a pinch of salt, too. It really confused me that there wasn’t any salt in this recipe. 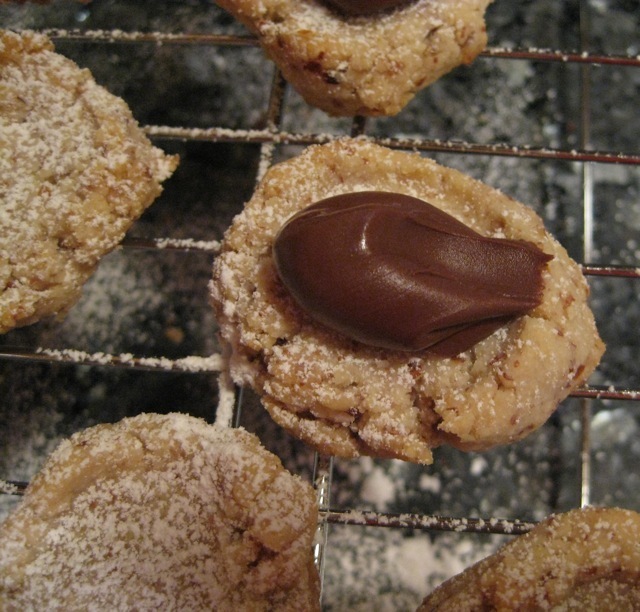 Ahhh… when great minds think alike… Nutella cookies are born! LOL LOL Weren’t they fantastic!? Sorry they weren’t fabulous for you Mine werer dry too! I definitely found these to be more nutty than buttery, as other people have described. And they were certainly dry. I still enjoyed the flavor, but I’ll keep looking for the perfect thumbprint. I love your addition of nutella to these – wish I thought of that! Sorry it didn’t work out. The nutella filling sounds yummy. Bummer these cookies didn’t work out for you! I used almond meal (is that the same as pre-ground almonds?) and it worked out great. If you give it a try again maybe try almond meal. Love your addition of nutella. I added that to my mental rolodex for next time. Dry and blah..that stinks..sorry they were’t a fav. I love the nut flavor. Sorry these were disappointing! It’s frustrating when you try all the tricks up your sleeve and they still don’t achieve greatness. Nutella sounds divine! I’m sorry yours didn’t wow you! I think a smear of nutella on a cookie would wow me, though! Nutella!! Genius. They look good, sorry they didn’t work for you. They look yummy with that glob of Nutella on top, always an excellent addition. I didn’t get a chance to make these. If I do, maybe I should try them with Dorie’s tart dough. They were pretty crumbly. I had to smush to get the little balls. I liked the jam filling. It was crumbly dough and I found chilling made the dough more difficult to work with. I added salt to mine and experimented with adding an egg yolk as well. Though the dough was crumbly, it was delicious to me. Nutella sounds like a great idea. I was really hoping that Nutella would taste fabulous, but it didn’t. I’m sorry they didn’t work out, but I love the Nutella addition! I do find it strange that recipes work out great for some and not-so-great for others. Sigh. I loved these, also with Nutella. Sorry it didn’t work for you. I just read your comment on my blog about defrosting the nuts. Who woulda thought, right?? 🙂 Anyway, the Nutella was a very good idea. Nutella’s a good idea (Nutella makes everything better, right?). I have to say, I used salted butter AND added salt, and I thought the dough by itself was great. As I mentioned, I had texture issues–maybe due to the coconut–but the flavor was good, and I think the sweet-and-salty thing definitely was a plus. I figured people would find a way to incorporate chocolate into these little goodies this week. A lot of people were complaining about how dry their cookies were, but mine were not, they were moist through the whole process. Sometimes I think that it is the brand of butter (and how much water it contains) that makes the difference, just a guess. My idea is that if these were eaten, they were good! Love how you put that chocolate in there, such style! Bummer that they didn’t turn out well for you! We were on the same wavelength with the Nutella. At least you have the rest of the jar of Nutella to enjoy! The nutella was a good idea. I think you’re right that maybe there should have been some salt. Sorry you had trouble with the dough. I used almonds also but ground my own. Didn’t quite know how much to grind them. Wonder if that is where the secret to these cookies is hidden. Nutella certainly sounds good. The Nutella looks delish! I am with you – these were OK, but they didn’t float my boat.